In this episode of Believer’s Voice of Victory, Kenneth Copeland reveals the most powerful element of putting the basics of faith into action: Faith and love work together! When we apply faith based on God’s love for us—and our love for Him and others—our faith is empowered to do all He intends it to do. Tune in and fire up your faith with love! Champions are known for winning and bringing change to situations. Have you ever thought about how to become a champion of faith? On this Believer’s Voice of Victory, Kenneth Copeland shares the basics of “champion status” for God’s people. 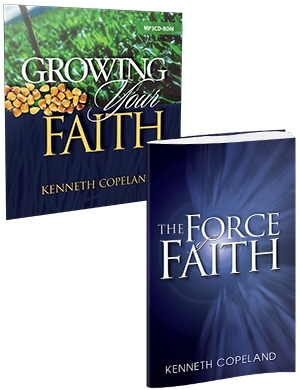 As you begin putting the basics of faith into practice, you can become a champion of faith! You have been chosen by God to win in life! Join Kenneth Copeland on Believer’s Voice of Victory, and learn how to renew your faith for victory. It’s time to stop feeling unworthy of God’s promises. Begin putting the basics of faith into action by renewing your mind to the victory Jesus has already won for you! Did you know that you can resist the devil with joy? Yes, the joy of The LORD is your strength! Watch Kenneth Copeland on Believer’s Voice of Victory as he explains more about putting the basics of faith into action and what to do when you find yourself weak and discouraged. Discover how you can laugh your way to victory!